(Valencia, Spain. 20 December 2018). Until the end of January 2019, SanLucar, the premium brand for fruit and vegetables, will deliver around 300 tons of table grapes from Ecuador to Europa. Those stem from the GLOBALG.A.P. certified SanLucar farms Santa Elena and Lourdes. This new export programme makes the company the main producer of Ecuadorian table grapes for sales abroad. 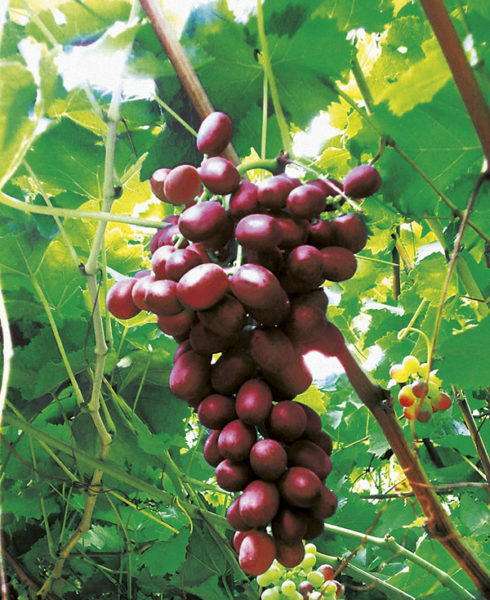 By shipping a container of the grape variety Crimson in 2016, SanLucar was the first company to export seedless table grapes from Ecuador to the European market. This time, however, it is a more ambitious project with great novelties. In total, up to 20 containers will arrive at the port of Rotterdam in the following weeks, which will be distributed to the most important supermarket chains in Europe. In addition, the range of first-class export grapes will be expanded to three varieties: table grape Crimson, Jack´s Salute and Sweet Globe. The climatic conditions in Ecuador have proven to be optimal for the cultivation of table grapes: they deliver a product that is widely accepted in countries such as Germany due to its excellent quality and taste. In autumn, SanLucar shipped the first samples of these varieties, which were tested on the company´s trial fields in Ecuador and have been rated with excellent results. This led to the selection of these three special varieties for the commercialisation on foreign markets. To ensure the continuity in the grape production process and to monitor the quality of these fruits, SanLucar has been working in constant collaboration with Agrocalidad since 2016. This official Ecuadorian agency is in charge of control and regulation for the improvement of plant health and food safety. „We are very happy with the progress of our programme for developing the grape production in Ecuador, which we started in 2014. Moreover, we are grateful to Agrocalidad for the cooperation and support they constantly give us”, explains Leonel González, Country Manager of SanLucar Ecuador. As a result of this close collaboration, technicians from Agrocalidad visited the SanLucar premises in Santa Elena last Tuesday, 18 December. On this occasion, they monitored the work of cutting as well as packing the fruit and also supervised the managing of the plantation and the grape exports. Today, SanLucar has three farms in Ecuador. On the farms Santa Elena and Lourdes, not far from the region El Azúcar, 200 employees work on a total area of around 370 hectares. Passionately, the team cultivates SanLucar´s special table grape varieties. All year long, the company also produces bananas on the farm Magdalena near Puebloviejo. And that´s not all: With the sustainability programme d.r.e.a.m.s., SanLucar realises projects to protect the environment and to benefit the people. The company also participates in various social projects in the sectors education, nutrition and sport, for example, with the d.r.e.a.m.s. sports school in Puebloviejo, supporting employees and their families. SanLucar, the premium brand for fruit and vegetables, is a globally positioned enterprise with subsidiaries in Germany, Austria, Spain, Tunisia, South Africa, Ecuador, Benelux and Dubai. In 1993, the company was founded by Stephan Rötzer from Munich and employs approximately 2,800 people today, the majority of them working on the company’s own farms and in SanLucar offices on four continents. With a range of more than 100 varieties of fruits and vegetables from more than 35 countries, SanLucar is the brand with the broadest assortment in the retail trade. In line with the philosophy “Taste in harmony with people and nature”, SanLucar is a responsible player on the global fruit and vegetable market and is currently expanding into the Arab Gulf States, Russia, China and Canada.